The long-awaited second season of Attack On Titan finally arrives on Blu-Ray and DVD this month. Ahead of that though, fans in the UK have the opportunity to see the director's cut movie edit of the season Attack On Titan: The Roar Of Awakening on the big screen: thanks to Anime Limited and Showcase Cinemas. The film is also due to screen as part of Glasgow Film Festival. Anime Limited describes the film: "Join the ranks of the Survey Corps for the latest big screen outing complete, as The Roar of Awakening recounts events that see entirely new threats and a fresh Titan invasion test its members to their limits. 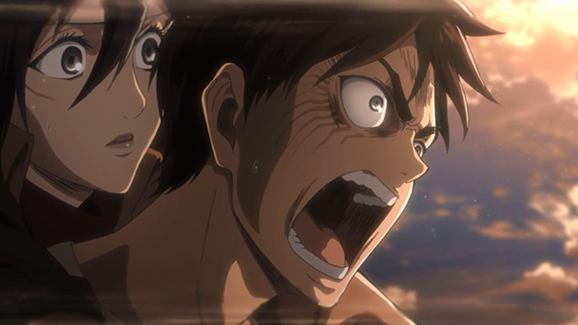 With incredible action and shocking revelations aplenty, there’s no better way to witness the continuation of Attack on Titan’s dark and mysterious story."